Whenever you download something from the website, you will be asked with Save As dialogue box, which allows you to store your file into selected location. The conventional and by default view of dialogue box consists of My Recent Document, My computer, My Network, Desktop, and My Documents. You will definitely save your files in a systematic way to locate them easily later. To save files into predefined folders you have to follow the time consuming process repeatedly. It means, you have to navigate to Drives>>folders>>selected folders. It is quite cumbersome process to repeat entire process again and again to save files in single folder. Here is the solution for this problem, named as Places, which allows users to customize “Save As” Dialogue Box according to their preferences. This one is the useful utility, which make saving process easier and faster. Once you install this utility, you will be enabled to replace the by default shortcuts with your desired folder shortcuts. To perform the replacing shortcuts, you just need to launch Places utility application and choose the Custom option from the drop down list. Now browse for the destination folder where you would want to save your files. Once you’ve finalized the selecting procedure of destination folder, you can view the preview of changes by clicking in Test button. Here you will see, how the “Save As” dialogue box will be appear after the changes. 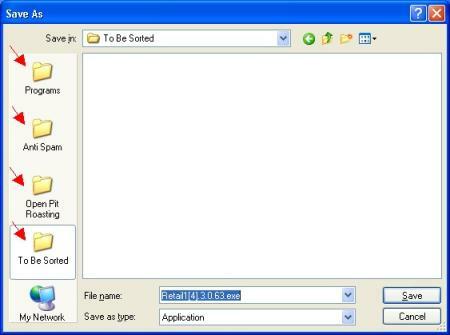 Places 1.0 utility is a free to download and supports Windows XP/Vista/7. You just need to have administrator privilege to customize the Save As dialogue box with Places utility.